Sharp Bus Lines Buys 60 New School Buses With 360-Degree Cameras, Collision Avoidance | Sonny Merryman Inc.
BRANTFORD, Ontario — Sharp Bus Lines has acquired 60 new Thomas Built Saf-T-Liner C2 school buses with technology aimed at enhancing the driver’s view around the vehicle. The new diesel buses are Sharp’s first to be equipped with the new Perimeter View 360 camera package (PV360) and Mobileye collision avoidance through Thomas Built Buses. Both systems are part of Thomas Built’s BusWise suite of technologies. 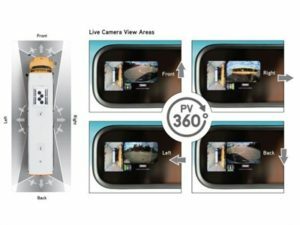 The PV360 provides a 360-degree “bird’s eye” view around the exterior of the bus, with screens that are stitched together to create one seamless image, according to Thomas Built Buses. Four high-resolution, wide-angle cameras are installed in the front, back, left, and right sides of the school bus, providing the driver with real-time video images of what is happening outside the vehicle. If the driver needs a closer look, he or she can toggle between cameras for a close-up. Mobileye collision avoidance is another factory-installed option for the Saf-T-Liner C2. Thomas Built said that the system warns drivers of potential collisions and provides pedestrian and cyclist detection, headway monitoring to avoid tailgating, lane departure warnings to help avoid drifting, and speed limit indication. Sharp Bus Lines has a total of about 1,600 school buses. The company was ranked No. 8 in SBF’s 2017 Top 50 Contractors list, which is based on number of school buses.